A Canadian chain reaction of kindness had us waking up in a soft bed in Banff. As we descent down to the kitchen to meet our hosts Keith and Leslie we’re immediately greeted with a big hug from Leslie followed by Keith’s bear squeeze. The next two days we’re pampered with liters of coffee, Keith’s awesome grill chef skill and Leslie’s wilderness experience (bears!) she gained from years of hiking through remote trails. Having ridden the whole GDMBR, Keith is a wealth of knowledge about the route and we spend many coffee sessions discussing various aspects of the trail. Wildlife, water and food strategies. Do carry a bear spray past Banff, don’t carry more than two days of food, don’t worry too much about water except past Pinedale, Wyoming. Most importantly Keith is content with our bike setups. While in his garage we contemplate whether I should change my rear tire in Banff and Keith offers his almost new Ardent. We briefly look at the fading thread and decide sentence my old tire to death by GDMRB. We’ll be fine. For our first night Keith suggests his favorite camping spot and with this he unwittingly sets the Canadian chain reaction back into motion, as once we arrive at the designated place we are presented with fresh lake trout by some Canadian anglers who happened to be in this area. Here we are, making trout on a fire in bear country. Before retiring to the tent for the night we make use of Keith’s suggestion and hang our food of the bridge, way beyond bears’ reach. We also make a deal with one of the butterflies “safe passage through bear country for transportation from Alberta to BC”. Riding GDMBR out of Banff is all about big Rockies and tight trails hugged by berry bushes on each side, and open spaces, and green stuff all around us. We ride slow and we ride loud. Making bonfires once we are out of National Park land keeps us warm and reminds us of riding back home, where having a fire is part of our ride-sleep-ride ritual. We meet many cyclists riding the same route as we do. Some are experienced, some are not. Most of them have one thing in common though. They carry lots of stuff. Those with experience have already started shedding kilograms by sending packages home, those without experience cling on to their stuff and show faces turmoiled by logging their excess luggage up endless vertical miles on the trail. There’s not much difference between us, we all came to enjoy the Mid-Western backroads and sleeping outside for days on end, and we are just as happy having our post ride beer once in town. It’s the fine print that separates our experiences. Descents they would call horrible, we will call fun; their impassable trails we would call challenging. For most of the time we’re not really faster than most of the pannier’ed riders, but we enjoy taking long breaks on top of Alberta’s, BC’s and Montana’s passes, gazing at the ranges behind us and looking forward to the ones in front. We really enjoy teaming up with fun people and we often share the camping or ride trails with new friends. While climbing the Elk pass my rear wheel gives first signs of tire wear and I feel the tire deflate considerably in a short time. A bit premature by my calculations hence I decide to quite things down by adding some more sealant; the last time I did that was nearly two months ago in Keflavik. This helps only for a short time and the next day I finally decide to take the tire of and have a look what’s happening inside – all the Stan’s sealing oozing out at the tire’s bead doesn’t give me a warm feeling. After two and a half months and some 3500 kilometers the Ardent’s bead separated from the sidewall. Death by GDMBR it is. I stich the tire together with some dental floss for the upcoming 100-kilometer ride to Fernie, the next town with bicycle shops. We leave the official route for a few days and once we have spent a small fortune on new rubber – Saska got the only Ardent 2.4 that was in town and I had to settle for a Schwalbe Rock Razor 2.3 – we follow the highway straight to Rooseville where we cross into the US. Montana strikes us with immense heat straight away, gone are the green valleys and meadows. Montana’s colors between Rooseville and Eureka are yellow and golden brown. We stay overnight at the town park where camping is allowed and even free showers are available for guests. Do you hear that Scotland? At night we hear some other cyclists roll in and we immediately recognize their voices. It’s Jos and Magda whom we met the first time in Sparwood and like from the very first second. We spend the next morning catching up with our stories and Jos proudly presents his picture of a cougar sunbathing on the trail, a very rare sight, even for those who spend years roaming the Rocky Mountains. Jos and Magda decide to stay in Eureka for a resting day, while we decide to head out. As we say our goodbyes we keep our fingers crossed for another meeting somewhere on the trail. Out of Eureka we climb the hills and make a stop in Polebridge, a small community known for its remoteness and great bakery. Their huckleberry & beer bread truly delivers some serious flavor and texture, similar to the polish hałka or Lodz’s speciality żulik. Serve with butter! Montana is known for being home to some of the best craft breweries in the states, not only does the beer taste good but it comes in really cool cans that give inspiration for some stove tinkering. On the way down to Whitefish we kill the heat of the day in the cool waters of Red Meadow lake a popular camping destination for locals. Once in town we grab a beer with Ryan and Jamie fellow GDMBRers who’s paths have been crossing with ours multiple time. Before we left Banff, Keith made sure we’d see each other again and arranged with his friend Cricket a stay for us at the awesome Whitefish Bike Retreat. The retreat not only has some cool, bicycle themed, interior arrangements, but is fully interconnected with the dense Whitefish single trail network. Single track ride to a beautiful lake? This place has you covered. Downhill dash downtown, avoiding the busy highway? You got it! Cricket, who’s the owner, did a great job at renovating an old farm and turning it into a rider’s dream. Being a rider herself, Cricket understands what other cyclists crave, whether they need a resting day on a tour or are looking for a basecamp for mountain biking exploration of the Whitefish area. We spend two quiet, lovely days resting with Cricket, Keith, Dawn & Joe, Jason and the most awesome dog trio ever Lego (give me back my cookie! ), Shot and Mocha. For the evenings Keith and Saska join forces for some delicious grill and salad indulgence and I have a stove building with Keith. Building cool looking stoves seems to be the only reason we drink beer in Montana. Thanks for having us over and taking such a good care of us! Before leaving town we sent some warm layers forward to Arizona, stuff we hardly used and that was unnecessarily filling our bags. Earlier that day we made a trip to the local Thrift Store and bought some summer layers for a few dollars. We like these shops a lot. Once out of Whitefish we leave the great Rockies for a while and enter Montana’s ranch country. For a while we see the hills only from a distance, a mere background the endless grazing grounds for horses and cattle. In Ferndale we meet Scott and Jackie, who invite us to stay in their backyard for the night. They are a year short of their retirement and already making big plans for future trips to come. While working in Berlin they commute everywhere by bicycle, foregoing owning a car altogether, and a coast-to-coast US cycle tour seemed a natural choice for them. It’s hard to surprise Scott with any touring and camping themed information. He seems to know everything about my bicycle and all the right equipment they need to make their dream tour happen. Scott’s pre-trip preparation might be the most impressive I have ever encountered. We’re sure they’ll do great on their trip. Riding out of Ferndale we meet a Finnish cyclist riding the divide northbound. From him we get all the latest intel on Jos’ and Magda’s whereabouts and quickly make a plan to try and catch them in the next 3 days. Holland Lake, Seeley Lake, Cottonwood Lakes, Ovando, Huckleberry Pass, Lake Reservoir, Lincoln all pass without a single trace of our Dutch friends. Along the way we join forces with Peter, who’s riding the trail on his Salsa Deadwood, sporting some serious 29+ rubber. We usually lose track of each other’s during the day, but end up in the same food joint or camping luring Peter to our spot with promises of cold beer we’ve been hauling over Montana’s rough back roads. It is only past the Stemple Pass that we get the next update on Jos’ and Magda’s whereabouts. At Barbara’s place, known for hosting divide riders, we meet Jacob and Eefje, also a Dutch couple riding the divide. They report to have spent the last two days camping with our flying Dutchmen and that their next destination would be Helena for some resting day. Earlier that day, in Lincoln we made the decision of skipping Helena and taking the Rimini road alternate to Park Lake. I have not been feeling that well since we left Ovando and we decide to call it an early finish, and stay to enjoy Jacob’s and Eefje’s company. This way we get some rest for me and maximize our chances of running into our friends. The trail between Lincoln and Basin is short of amazing. The trail narrows down to a tight double track; smooth gravel gives way to rocky trails. That’s the terrain we enjoy riding the most, even if it means walking parts of it and walking up usually means having a blast riding down. We all might have different setups, but always end up at the same camping spot. It truly is amazing the type of terrain Jacob and Eefje are capable of tackling. Sometimes we’d pass them while they’re pushing their bikes through some nasty terrain, but let them put their feet on the pedals and they are flying. These are some strong riders, right in front of us. It’s funny how the otherwise flat Holland can produce these remarkable people, cycling mountain pass by mountain pass in these endless Rockies. I’d see some panniers on our bikes for more remote places in West Asia or South America, where supplies for more than 5 days have to be carried. 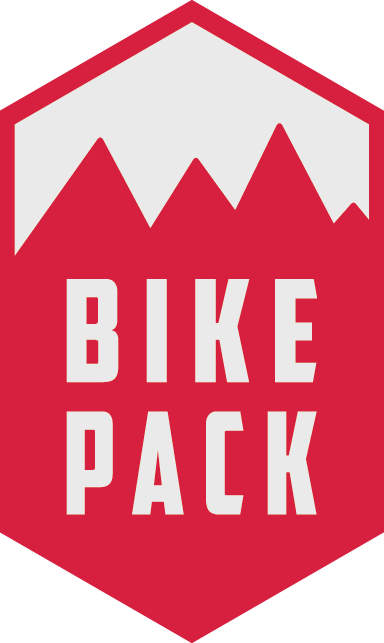 Nonetheless we plan on sticking with our bikepacking setups on this tour. After the remarkable 2300-meter mountain traverse to Basin we end up in town enjoying a ridiculously large and delicious pizza at the Leaning Tower of Pizza. Our debit cards would not work for some reason and the owner couldn’t stand the thought of letting us go without a meal, so she gave us a self-addressed envelope so we could send her the money later. We can’t believe the good things that happen to us along the way. The weather report shows several storms coming into the area and we leave Basin heading right into the dark skies boiling over the hills. At the highway viaduct, the only shelter in some 5 kilometers back to town and some 25 ahead on the trail, we decide to stick around and wait for what the weather has in store for us. Some minutes later the horizon gets all gray and a roaring sound, as if there was a large waterfall, starts approaching us. Soon after this we see the first ice clump hit the pavement, and the next one, and a whole wave of ping-pong sized hail starts filling the sides of the road. We see drivers taking refuge at the same place as we do. It’s quite obvious we made the right call, but what about our friends? Jacob and Eefje have left more than an hour ahead of us, Peter some 20 minutes. And Jos and Magda? Are they still on that 2300 ridge going from Helena to Basin? There’s not much shelter along the trails except of big trees and an outhouse near campsites and recreation areas, and these are few and far apart. We see Jacob and Eefje later that day, as me and Saska are racing an incoming storm to the nearby outhouse I see marked on my GPS. They are hunched down under a tree and refuse to move any further, even when I suggest the outhouse is just a kilometer away. They’ve been hit badly by the last hail storm, having only their bikes as protection. It’s hard to imagine that the truck driver who drove past them, didn’t stop to help them… Their bruises look like the remnants of an encounter with riot police. Luckily it’s only bruises they carried out of this storm. In these places it’s hard to find a shelter. We had one. We really can’t believe the good things that happen to us along the way. Some things are hard in life. Some are simple. It’s hard to tell whether we like Canadians more or Americans, or maybe we just like North Americans all together? Was Monday the best riding day or was it Thursday, or maybe it’s just today? Do we enjoy Montana’s summer heat more or the cool days above 2000 meters, or is it just being out in the open? One is for sure, we were certainly glad to be under a highway viaduct once that ping-pong sized hail started hitting the ground all around us. And we are glad to be in the Endless Rockies. Tagged Alberta, British Columbia, canada, GDMBR, Montana, Rockies, USA. Previous: Previous post: We can-Canada! Missing your updates here. I hope things are still rolling well since we last saw you in the Basin. We slept at the church in Wamsutter that night so you likely missed us. I hope the “sky with nothing in between” was not too much for you. I ran out of time in Salida but Peter left after a day getting his knee looked at. The big news was J&M switched up to a pair of Blackborrows and soft luggage in Steamboat and we caught up before I left Salida. They are close to the end now, we’re at Grants Friday. I hope the rest of your travels go well, I’m sorry we did not ride more together. Ride on and keep the rubber side down! Hi Michael, we slept in the desert some 20 miles before Wamsutter. I couldn’t really stand the “sky with nothing in between” aspect of this place and we eventually hitched a ride to Colorado. No regrets, Colorado Trail was much nicer. Hope the rest of your trip was great! We are now in Arizona taking a rest, should be rolling again by the end of the week. Only two weeks left of our visa, then it’s Viva la Mexico for us. Great to hear you got out okay, Jos, Magda and I were all a bit worried when we did not see you again. Loved the pics in the new post – so much better images than mine. You guys take care. Looking forward to the insight on Baja.